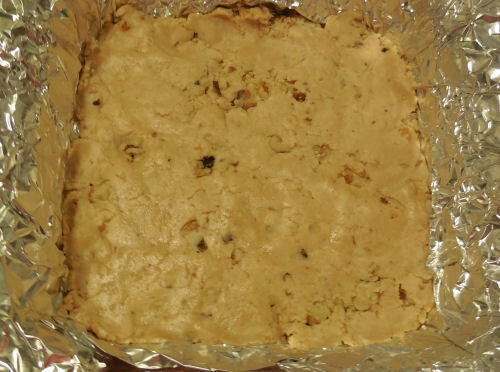 My daughter is a vegan and she always loved my peanut butter fudge that I make this time of the year for the holidays. 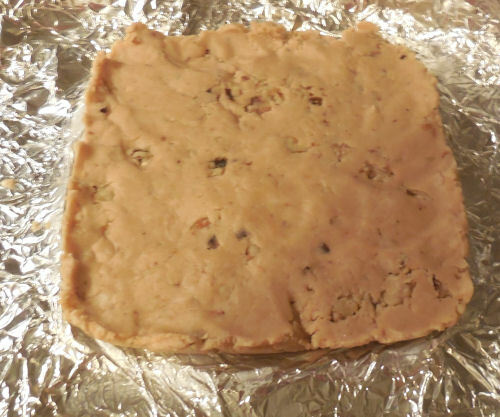 She can’t eat my normal version but this vegan peanut butter fudge is very good is perfectly suited to a vegan diet. 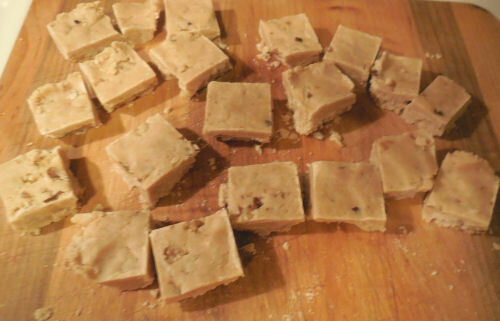 Making fudge is something that I love to do during the holidays. It is pretty easy to do, too, if you follow my fudge making tips. There is no reason for Vegans to miss out on sweet treats. With the right substitutes, many normal recipes can be transformed into new favorites. 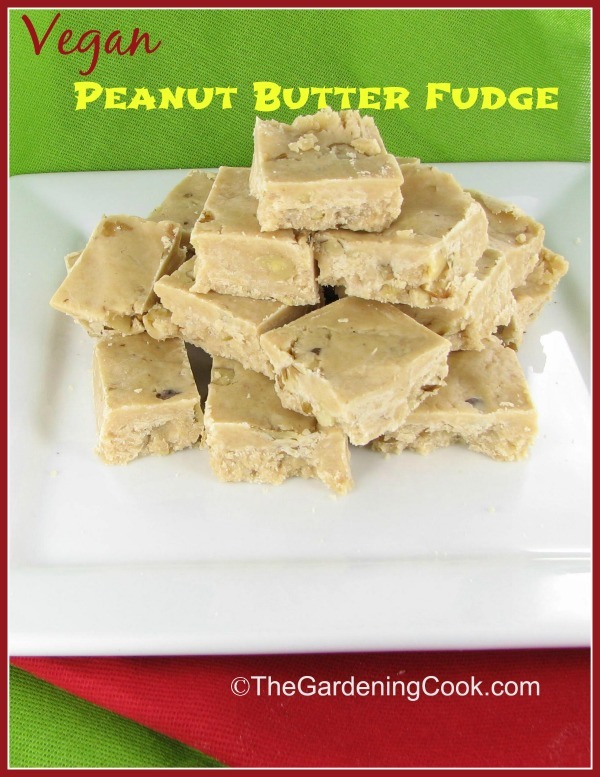 This recipe for peanut butter walnut fudge uses Earth Balance Margarine instead of butter. It is rich and delicious and will tempt even those who normally don’t care for vegan food. The recipe is very simple. 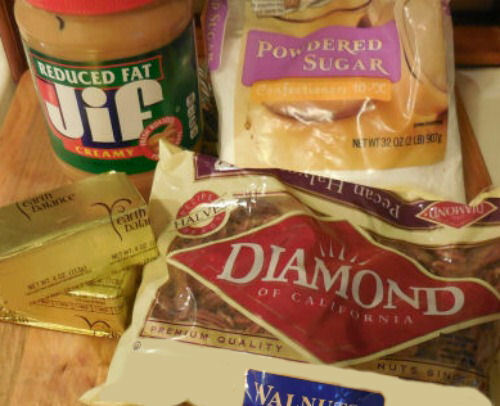 It uses just four ingredients: Peanut butter, vegan Earth Balance Buttery sticks, confectioner’s sugar, and chopped walnuts. Measure your ingredients and have them ready before you start. 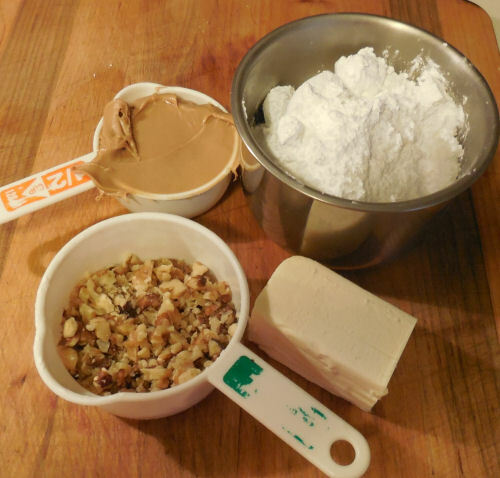 The recipe comes together very quickly at the end and you will want your sugar and walnuts already to go. Prepare your pan first. Line a 9 x 9 inch pan with aluminum foil, bringing the foil up the sides of the pan. Melt the Earth balance in a saucepan over medium heat. Remove from the heat and add in the peanut butter, and stir until smooth. Add the confectioner’s sugar, a little at a time. 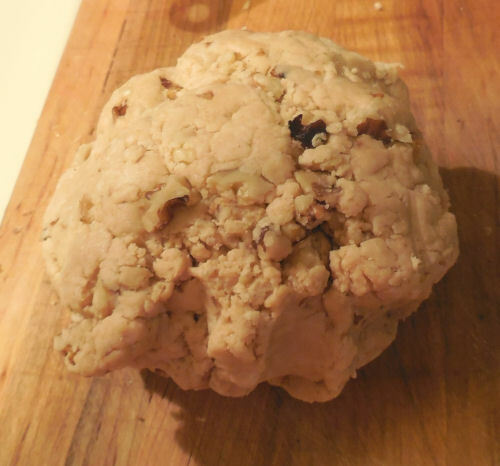 It needs to be mixed well with each addition or it will be lumpy. 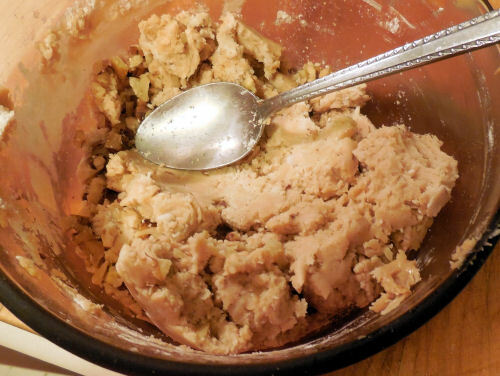 When you get to the last of the sugar, it will be almost like the consistency of a pie crust. Fold in the walnuts and form the whole thing into a large ball with your hands. Pat into the prepared baking dish and chill until firm. This recipe makes fairly thin slices, but you can, of course, double it if you want them to be thicker. When chilled, lift the fudge out of the pan with the foil handles. Carefully peel off the foil and cut into squares. 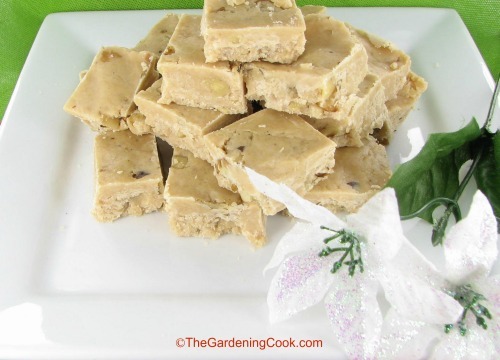 This peanut butter fudge is perfect for Vegans but those on a normal diet will love it too. It's not too sweet. 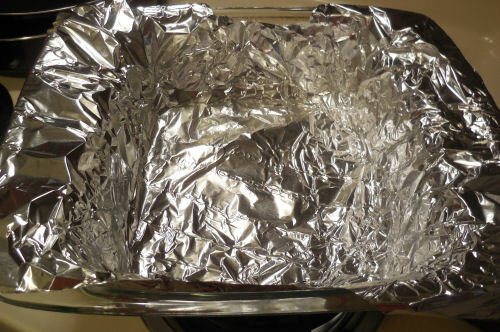 Place aluminum foil in a 9×9 inch baking dish. Bring the foil up the sides of the dish. 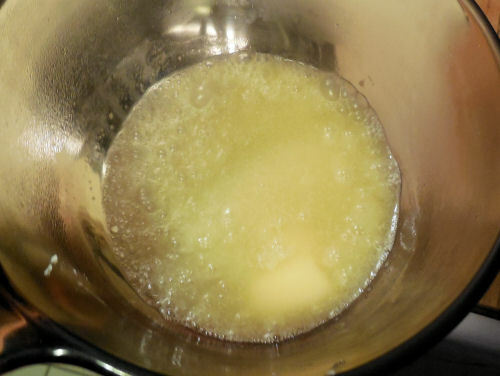 In a saucepan over low heat, melt the Earth Balance margarine. 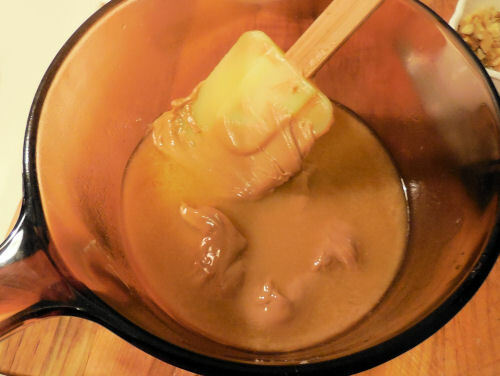 Remove from heat and stir in the peanut butter until the mixture is smooth. 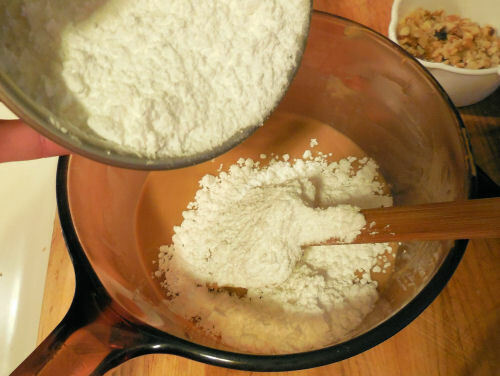 Mix in the confectioners’ sugar, a little at a time, until it is well-blended. Quickly fold in the chopped walnuts. Put the mixture into the foil lined pan and chill until firm. When firmly set, remove from the pan with the foil "Handles." Carefully peel of the foil and cut into squares.